What's really going on when you peel a PSA? With the default conditions of a 90° peel, a 50μm PET carrier and a 40μm PSA being pulled with a force of 50N/m you get a Tensile (pulling) stress that is high right at the peel front (to the right) and which decreases ahead of the peel and which goes negative (i.e. a compression) ~0.5mm ahead of the peel. This one curve is enough to show that things are complicated. Now decrease the carrier thickness or reduce its modulus (1GPa for PE compared to 4 for PET). This makes the stresses larger and more concentrated. In other words, a change to the boring carrier can be just as important as a change to the adhesive itself. 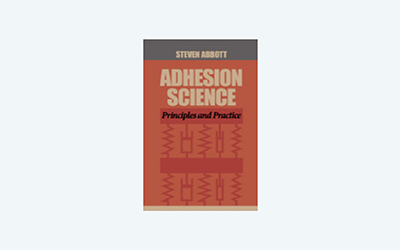 Adhesion is a Property of the System. Peel seems intuitively obvious. There is a peel tensile stress acting to pull the adhesive away from the substrate. End of story - unless you want to take into account the plastic deformation of the thing you are peeling as discussed in the PSA Testing page. For relatively stiff adhesives this is not a bad approximation. For more viscoelastic adhesives it is likely that the elastic regime assumed in the analysis is over-optimistic and failure sets in early - though in such cases the modulus (via WLF) is highly speed-dependent so the peel will approach the theoretical value at higher speeds. Having said that, stronger adhesives might fail with the large strains at the sharp radius of the peel strip. So failure is possible with an adhesive that is too weak or too strong - one of the many confusions provided by adhesive testing. The Bikerman calculation is appended to the Kaelble analysis below, though the peel angle input is ignored and the quoted value is for 90° peel. As DH Kaelble, one of the greats of adhesive science, showed theoretically and experimentally, things are even more complex than Bikerman. There are strong tensile stresses (of course), along with strong compressive stresses (unexpected) and strong shear stresses (not so obvious). The relative sizes of all these stresses depend on the peeling system, not just the adhesive. So the modulus, E, and thickness, 2h, of the backing tape (peel strip) are important along with the thickness, a, of the adhesive as well as its tensile modulus, Ea, and shear modulus, G, both at whatever timescale is thought relevant for a typical peel, though the shear forces generally act over a larger distance so the effective timescale is often 10x longer. In turn, `β=((3E)/(8Mh³a))^¼` and `α=(G/(2Mha))^½`. These are both 'stress concentration factors', a term much used in fracture mechanics. The pre-factor `σ_0=(2βFsinθ)/(1-K)` and `λ_0=αFcosθ`, where θ is the peel angle and F is the peel force per unit width (N/m). Note that at 90°, `λ_0=0`, so there are no shear stresses at this angle and that the shear curve flips sign above 90°. The factor `K=(βM)/(β"Mo" + "P"sinθ)` where Mo is the moment of tensile force. To keep things sufficiently simple in the app, K is held at 0.75, a good enough approximation to show the main trends. For simplicity, the app uses just one modulus (Ea) for the adhesive and G is computed as `E_a/(2(1+ν))` where ν is the Poisson Ratio, assumed to be 0.5. Those with a keen eye will notice that for the same overall force the shear stress near 180° is very much less than the peel stress at 90° even though the "same" effective force is being applied in both cases via the cos(θ) and sin(θ) terms. Why is this? The reason is the different "stress concentration factors" α and β. They have units of 1/length and α is much smaller (the effective length is much longer) than β. There is no magic here. The peel force is quite sharply focussed near the peel front while (for a relatively soft PSA) the shear force is spread out over a long distance. If you increase the modulus of the adhesive the rather boring straight line showing the shear stress becomes a clear exponential and the shear stresses around the bonding area become much larger. A well-intentioned "strengthening" of an adhesive can lead to earlier failure because the stresses are much more concentrated.